Both the classic Female voice and the new Male voice are very high quality, but some users may generally prefer the Female voice, which tends to sound less robotic and closer to the original voice anyway, though some of this depends on the accent and language too. Regardless it’s fun to play around with the two voices and see which is better suited to your own preferences. You don’t need to leave the Settings panels to summon Siri, so you may want to ask Siri question or two “what is the time, tell me a story, etc” to hear the more subtle differences between the two voices. 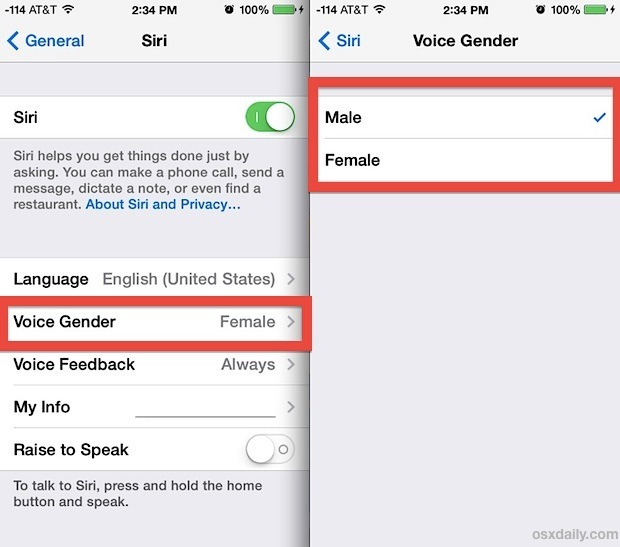 A total voice gender change can also be done prior to iOS 7 by using this language change trick, which swaps the gender of Siri depending on the accent of the language chosen. That method still works too if you want an accented version of Siri as well as a new voice, but it may cause some unwanted comprehension issues as both Siri and you battle to understand the difference of pronunciation and accents, even if you switch to one that isn’t too different from what you speak normally. We got an email from a reader (thanks Carla & Ryan!) suggesting this trick be included as part of the recent usability improvement tips post, because apparently some young kids like one voice more than the other, but whether or not it belongs in that category is kind of up to you and your own preferences. 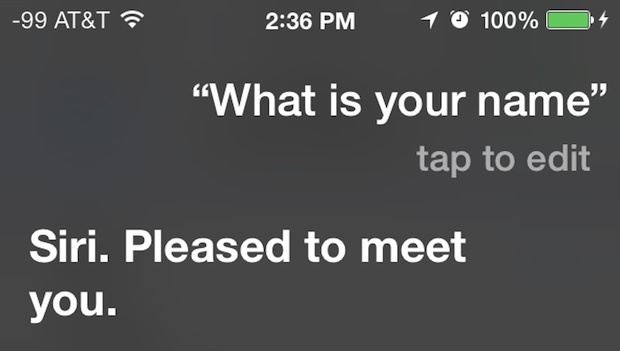 Anyway, enjoy Siri, whatever your voice choices may be, and remember there are nearly infinite things you can ask the virtual assistant.